The interior of Structure Ten is cleaned ready for further floor unravelling. One of the more unusual stones to be found at the Ness is pitchstone – that hard, black, glass-like volcanic material which originates 400 kilometres to the south-west, on the island of Arran. Clearly, it has been traded to the Ness and we already have eight or nine examples from past years. Today, the biggest piece we have seen turned up. It was found, undoubtedly re-deposited, in the wall core of the late Structure Twenty-two, which lies on and over the north side of Structure Fourteen. (At this point, can we remind you that the outline map of the principal structures is available here as an aide memoire. Even we get confused). Moreover, the piece of pitchstone found today is a sort of mini core from which flakes have been knapped off. The most peculiar fact is that we have no idea what it was used for. It is more brittle than flint and harder to knap successfully, but Hugo and Ben, who know about such things, point out that the pitchstone core has been rather badly knapped. Flakes have just been struck from it, but not in a way which would have resulted in a decent working piece, although its flakes would be devilishly sharp. It is undoubtedly a pretty thing, but its purpose remains obscure. A section of the finely incised slab found in Structure Ten, showing the chevron designs. Click the image for a larger view of the stone. Another decorated slab . . . Yet another handsome incised stone has been found on the inner face of the outer wall of Structure Ten (the wall of Structure Ten is over four metres thick and consists of two stone walls (inner and outer) separated by a midden wall core) as work continues on one of the sondages investigating the robber cut. Like so many of the decorated slabs at the Ness, this one once placed would have been hidden from view within the wall. Incised stone of this sort is something of a rarity in this structure but, in the next sondage down and in the north-west corner of Structure Ten, a massive stone slab has been found. This is just the area where the “paint workshop” was situated and the slab appears to be a foundation for the primary phase of the building. 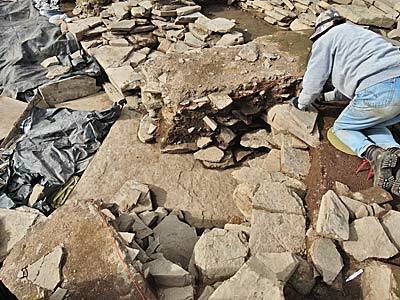 Not all of it has been revealed as yet but at the moment it is 1.5 metres wide, circa two metres long and 15 centimetres thick – was this part of a standing stone that was demolished and then incorporated into Structure Ten? Structure Ten has certainly been one of the busiest areas on site today. Structure Ten’s monumental foundation slab is being uncovered in the north-western corner of the building. The central covers have been removed and a thorough clean is taking place in a whirl of flying soil (thanks to the wind) in preparation for a renewed investigation of the floor deposits. Ingrid’s Smartfauna project is in full swing alongside Structure Ten. This is recording in great detail using laser scanning, rectified photography and 3D recording the massive bone deposit that was placed around Structure Ten at the end of the building’s life. Another square metre is being investigated and there is considerable speculation as to whether this square will match up to (or beat) the forty individual animals which came from the last metre square to be examined. Scott and Julia XRFing the midden baulk south of Structure One. 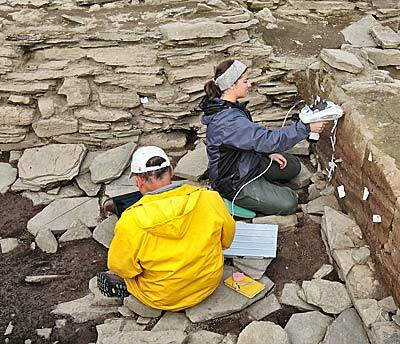 And speaking of animals, in the south part of Structure Twelve, Natasha has been investigating a small pit which contains some very large animal bones. Unfortunately, they have been squashed up, but Ingrid remains hopeful that they may yet be identifiable. The scientific name applied to this particular deposit is “monster coo”. The main central hearth in Structure One has long been the subject of particular interest. 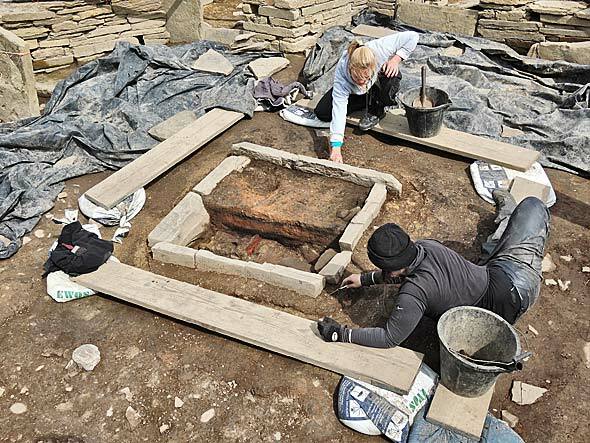 Today, the cut into which was inserted the hearth from the secondary phase has been uncovered. It is a lovely cut, running all around the hearth but hopes that the primary hearth would also have been located underneath have been dashed. It seems that the first hearth has been dismantled and this means that, in all probability, the important information which it would have furnished is also lost. Elsewhere, just to the south of Structure One, Scott Pike is blasting the last remaining midden baulk, with help from his student assistant, Julia, and his trusty X-ray fluorescence machine. And in Trench T, the notable success of the Wheeler quadrant system of excavation in the central midden area of the main trench has prompted its adoption in this very large trench. It may resolve many of the relationship questions between different areas of what is a difficult area to assess. Hello, I’m Tonnie Richmond, and this is my seventh season at the Ness. Every year I wonder if my knees will last another year and if this season will be my last. But I’m here again, and it is great to meet up with old friends and to make new ones. I started this week, so I missed the hot weather last week, thank goodness. I never thought it would be too hot for comfort on Orkney. Today is sunny and breezy and our buckets (when empty) keep blowing away. I am working on Trench T, the enigmatic feature on the south side of the Ness. Are we on top of an as yet undiscovered chambered tomb? Nobody is sure what is going on. We have curving stone revetments, lots of rubble and lots of midden material. And of course, the famous “crack of doom”, which, I can report, is no bigger than it was last year. The best thing about being in Trench T is the view – even more spectacular than the rest of the site. The wind is whipping up waves on the Stenness loch and Hoy, as ever, looms dark and lovely on the horizon. This dig is spectacular. But it costs money. 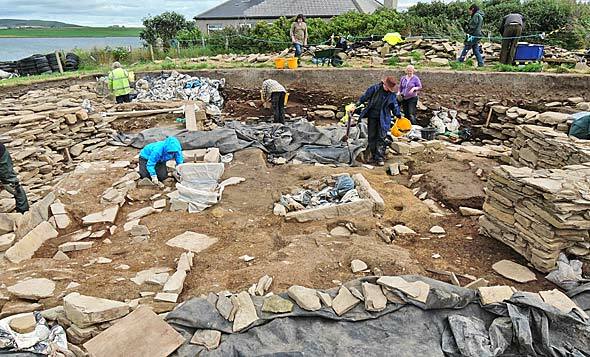 Nobody has prompted me to say this, but if you have not yet sent a donation to support the work at the Ness of Brodgar – do so now! Andy and Erica define the construction cut around the hearth in Structure One.